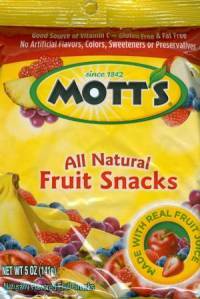 I thought today we would talk a little bit about Mott's all natural fruit snacks. Fruit snacks from a candy store? Yep. Why not tell the kids that you bought them from a candy store? I bet they'll eat them then. Mom approved snacks for the kids from a candy store? Not a bad idea. With school just starting, these fruit snacks would be a perfect snack to add to the bag lunch, use for an after school treat or just a little something mid afternoon for a pick me up. Let's face it, kids love candy and it is getting more challenging to get them to choose something healthy. Usually the better something is for you, the worse it tastes. Such is not the case with Mott's. I have to admit, seeing the words " All Natural" made me think twice before trying them. Imagine how the kids will think about that term. Mott's company has been making families healthier for over 150 years. Whether you are looking for fruit snacks, juices or applesauce in a variety of flavors Mott's has you covered. Most fruit snacks lack flavor and are somewhat rubbery, not something that you really care to eat. Motts all natural fruit snacks are the exception to those rules. To me they have a long lasting sweet flavor and remind me more of a gummy candy instead of a fruit snack. Something the kids will pick up on right away. So tasty, we even feature them on our Gummy Candy Page. We decided to carry Mott's fruit snacks for just those qualities. We like kids to enjoy themselves and know that it doesn't always have to be sugary snacks. I'm a Mom too, and I always tried to get our kids interested in healthy treats. Mott's makes the task a little easier. We hope you'll give them a try. Thanks For Reading and, Naturally, Have a Sweet Day! End of the Season for Big Star Drive In. Jerry Lewis Labor Day Telethon No More? Political Partisan Views On Candy. Really. Oh My! It's Back To School Kids. And Mom. Slo Poke Candy Bar Review. Wooo Hooo! The Days Are Getting a Little Shorter.